Fogel Grip (Bird Griffin, Swedish: Fågel Grip) was a Swedish sailing ship originally built in the Netherlands in the early 17th century. 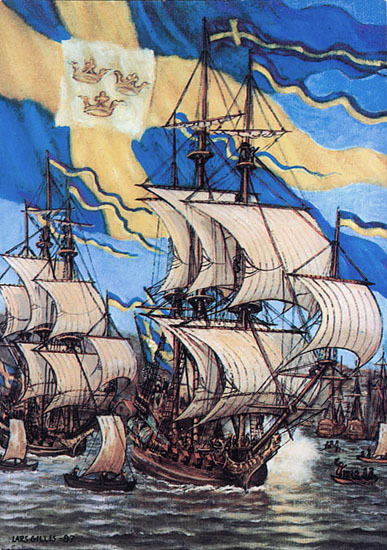 She was used on the first Swedish expedition in 1638 together with Kalmar Nyckel to establish the colony of New Sweden. Little is known about the vessel. Fogel Grip was a full-rigged pinnace about 30 meters (98 ft) long. Originally built in the Netherlands in the early 17th century the ship was bought by the Swedish Swedish South Company in 1636 or 1637. The first expedition was prepared in secrecy in fear of the Dutch West India Company which at that time dominated the area. The commander was Peter Minuit. In November 1637, Fogel Grip captained by Adrian Jöransen and Kalmar Nyckel captained by Jan Hindricksen van der Water left Gothenburg harbor. The crew was part Dutch and part Swedish; the Swedes on Fogel Grip were under the command of Måns Nilsson Kling. The expedition was caught in bad weather in the North Sea badly damaging both ships. Separated during the storm, both vessels made it to Texel for repairs. After about one month the expedition could continue and the ships left port on December 31. Passing the Canary Islands and Saint Christopher Island the expedition reached Delaware Bay in March 1638 sailing up the Delaware River where they made landfall at the mouth of Christina River in present-day Wilmington, Delaware. Fogel Grip then cruised the Caribbean Sea for some time before returning to New Sweden bringing the former slave Anthony Swartz from St. Kitts. The ship was then loaded with fur and tobacco before leaving for Sweden and on the return in around June 1639 the cargo was sold. In August 1639, Fogel Grip was shipwrecked on a sand shoal in Gothenburg harbor during a storm and abandoned. Models of Fogel Grip and Kalmar Nyckel are kept at Gloria Dei (Old Swedes') Church in Philadelphia, Pennsylvania. In 1938 the Swedish mail issued a commemorative stamp of both ships. ^ a b c Nilsson, Jan-Erik. "Kalmar Nyckel Project". Retrieved March 4, 2011. ^ "The Kalmar Nyckel: A Guide to the Ship and Her History" (PDF). Kalmar Nyckel Foundation. 2009. Archived from the original (PDF) on July 26, 2011. Retrieved March 4, 2011. ^ a b c d e Henderson, John R. (July 8, 2010). "A History of the Kalmar Nyckel and a New Look at New Sweden". Retrieved March 4, 2011. ^ Johnson, Amandus (1911). The Swedish Settlements on the Delaware. 1: Their History and Relation to the Indians, Dutch and English, 1638–1664. Philadelphia: Swedish Colonial Society. ^ a b c d "1637 The Bird Griffin". Rootsweb.Ancestry.com. Retrieved March 4, 2011. ^ a b Englund, Peter. "Det går allt ut på penningar" (in Swedish). Archived from the original on June 28, 2011. Retrieved March 4, 2011. ^ a b c "Expeditionerna till Nya Sverige". Nya Sverige i Nordamerika (in Swedish). Retrieved March 4, 2011. ^ Craig, Peter Stebbins. "Chronology of Colonial Swedes on the Delaware 1638–1713". Swedish Colonial Society. Retrieved March 4, 2011. ^ Boyle, Donzella Cross (2002). "Chapter 3: New Netherland and New Sweden Are Started" (PDF). Quest of a Hemisphere (PDF). Appleton, WI: Robert Welch University Press. Retrieved March 4, 2011. ^ "Our History ..." Gloria Dei (Old Swedes') Church. Retrieved March 4, 2011. ^ "'Calmare Nyckel' och 'Fågel Grip'". Posten (Swedish Mail). Archived from the original on August 27, 2011. Retrieved March 4, 2011.